The crawlspace of you home can capture moisture especially in the hot weather that the Atlanta and surrounding area experiences. Typically a crawlspace is equipped with vents designed to provide ventilation. These vents are to control moisture. However, by venting a crawlspace during air conditioning season allows the hot, humid outside air into the cool environment of the crawlspace. This ventilation actually increases the moisture. Once this moisture is present, it migrates to the colder floor framing surfaces causing wood damage and mold growth. This moisture and wood damage also provides an environment for insects to migrate. Moisture problems also depend on the amount of rain that is received. If groundwater remains near the crawlspace, this can lead to areas of standing water. However, crawlspaces can remain damp and moist without appearing wet. Because of the enclosed environment, earth evaporation, and exterior perimeter drainage, this can all contribute to the crawlspace becoming susceptible to mold, mildew, insect infestations and other things. Atlas Piers of Atlanta can help you with your crawlspace recovery in Atlanta by putting in wall encapsulation which is a process in which we cover the crawlspace with a vapor barrier. This will result in better air quality, reduce the chance of crawlspace floor and wood damage, and insect infestation. The benefits of crawlspace encapsulation are many. This will result in better air quality in all of your home’s living area. You will also have greater energy efficiency with an encapsulated crawlspace. It will also result in fewer insect problems. Lastly, there will be more comfort in the home because of the reduced humidity. 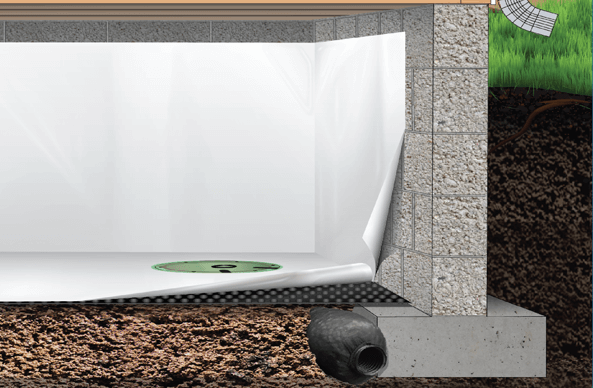 The products we use for crawlspace encapsulation are made by Earth Contact Products (ECP), the leading manufacturer of waterproofing products in the industry. These vapor barrier products are designed to stop water from moving into living spaces. So before you see these signs of foundation damage, let Atlas Piers of Atlanta keep your crawlspace moisture in Atlanta under control by putting in a vapor barrier. If you do start to notice signs of foundation damage, Atlas Piers of Atlanta can also help you with any foundation repair needs. As in the case with crawlspace encapsulation, our foundation repair products are manufactured by ECP. So you will know you are getting the best products made in the foundation repair industry. Contact us today for any of your crawlspace recovery Atlanta needs. By keeping the moisture in your crawlspace away, this will minimize the chance of foundation troubles later. We are here to help!